We welcome your donated goods. We stock almost every medical item you can imagine, from a tiny scalpel blade, to your unwanted medicines, to a hospital bed. Please don’t send us goods that are out-of-date, as MAA, like many countries now follow the WHO guidelines, that require donated goods to be in date. But if you want to donate something and you are not sure, send it anyway. Our team of professionals will always check it over for suitability. If you have any questions, email us, using: maa.akld@gmail.com. Partly used goods. For example, partly used pots of creams, or bottles of medicine. Chemicals and reagents. If you are not sure, then please do contact us. Delivery: If you are a pharmacy or medical facility within the Auckland area, contact PWR, (09 968 6750), who will probably be willing to move your stock to our rooms. Nationwide, ProPharma, (09 915 9500), are often able to help us by moving goods to the MAA store. MAA wishes to acknowledge and thank PWR and ProPharma for the help they give us with stock movements around New Zealand. Delivery Address: Goods can be delivered directly to our rooms – on Wednesday mornings only – from 9:30am until about 2pm. Please call our Store Manager, Dr Mary Joku, (mobile 021 027 34008) or email us for the delivery address, using maa.akld@gmail.com. If you have goods to donate but cannot visit our store rooms or use the two wholesalers listed above, then perhaps you might leave your goods or courier them to the Greenlane Clinical Centre Pharmacy, Building 4, 214 Greenlane Road West, Epsom, Auckland, 1051. The pharmacy is open Monday to Friday. MAA wishes to thank the pharmacy manager, Tony, for providing this collection point. Our stocks of both surgical and pharmaceutical products vary constantly. If you want to know what we have available, please email us using maa.akld@gmail.com. Medicines – please use generic names if possible and give a suggestion of quantities needed. Sometimes we do have to ration popular items. Some goods come in and go out quickly, so if you do not receive your full order, please re-order. Where have goods from MAA been sent? Click here to see a world-map with recipient countries marked on it, or click here to see a list of countries that have recently received aid from MAA. You will be asked to complete an End-User Contact Details form. This is to ensure drugs are being used by a qualified professional through a genuine medical facility. (See below for an example of this form). Unfortunately MAA is unable to pay for freight. This always remains the responsibility of the requesting agency or their sponsoring body. 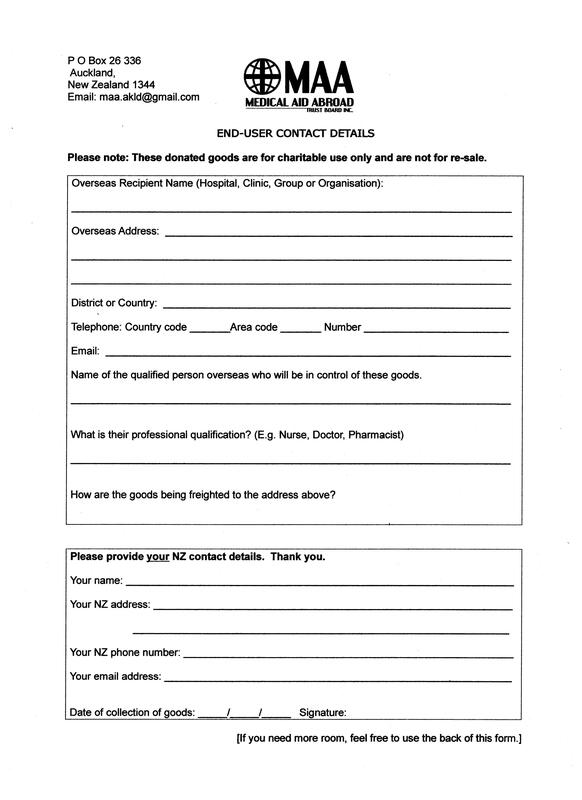 All organisations or their sponsors within New Zealand, will be asked to complete an End-User Contact Details form before the goods leave our control. The Receipt of Goods Declaration. The information that we get from this form helps us to know if the goods arrived where we they were needed, which methods of freight work the best and how useful are the goods that have gone from our store.